Meet Mike Luebeck, age 60, this week’s over 50 athlete of the week. Life has brought Mike plenty of challenges. And he has used every challenge to become a better version of Mike. 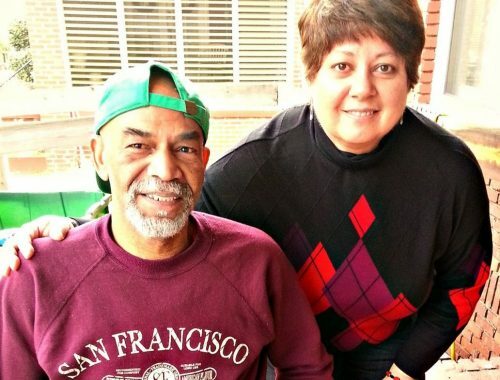 Read Mike’s story. Mike grew up in Southern California. Life was good – he was a respected police officer and engaged to a wonderful woman. Then tragedy struck – his fiancé died, throwing Mike’s life into a tailspin. Having lived through a tragedy, he no longer wanted to see tragedy every day as a police officer. So at age 45, Mike got a degree in Business and Management, quit his job and moved across the country to Atlanta, Georgia. While Mike’s brother lived in Georgia and his parents were considering a move to the area, Mike made the big leap with no job, no friends or experience living in the south. He started his new life in the Atlanta suburbs 14 years ago and hasn’t looked back. He landed a job at ParexUSA as a Logistics Manager. His first few years were focused on his new job and getting to know the area he now called home. His parents moved to Atlanta a year after Mike’s move, so he also spent time helping them get situated. 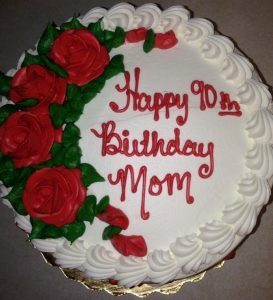 But only six years after Mike started a new life in Atlanta, his dad died, leaving Mike to care for his mom, who is afflicted with Alzheimer’s. A new challenge in Mike’s life. But he organized his new life to allow him to take care of his mom, continue his career and branch out into new interests. A buddy at work wanted to start running and asked Mike to join him. 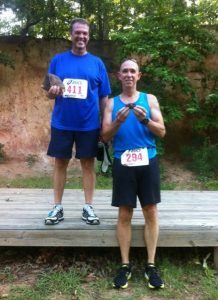 Mike jumped in with both feet, and for a couple of years, he and his buddy had a great time running 5k (3.1. miles) and 10k (6.2 miles) races all over Atlanta and the southeast. It was fun and Mike was getting fitter. In 2007, his buddy asked if Mike was ready to try a half marathon (13.1 miles). Always up for a new challenge, they began training for their first half marathon. Mike ran a few and found he actually liked the longer distance. He showed up for a half marathon in Albany, Georgia, when he noticed the line for the full marathon. And as he stood there, a thought took shape – that he would run a marathon. Not just any marathon some time in the future – THAT marathon. So with no training beyond 13 miles, Mike ran his first marathon at age 53. It wasn’t pretty, but he did it. AND he liked it. 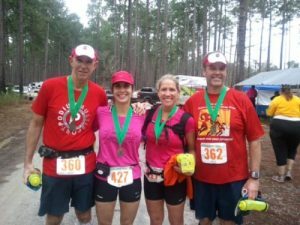 So Mike decided to actually TRAIN for his next marathon, and joined a local running group, Get Fit Atlanta. 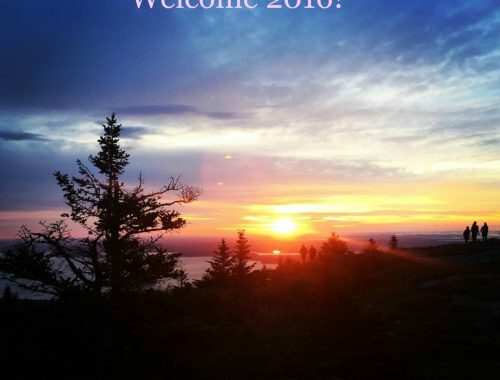 The group gave him friends to run with, a training plan and advice on running marathons. And much needed time and space for Mike, as a break from the demands of his job and caring for his mom. 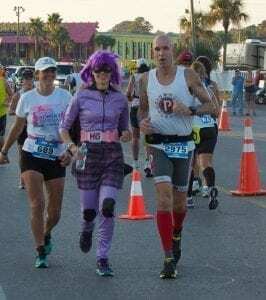 Mike was off and running marathons with friends – two more that same year! And more each year. 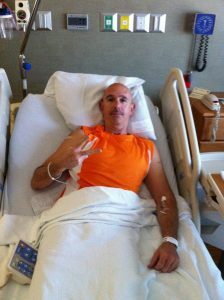 Just as he was hitting his marathon stride, April, 2011, Mike decided to participate in a charity bike ride of 30 miles. Before the ride was over, Mike was faced with his next challenge. A crash during the ride left him with a broken pelvis. As Mike laid in bed recovering from his injury, he watched coverage of a triathlon. Mike decided then and there that he would complete a triathlon. 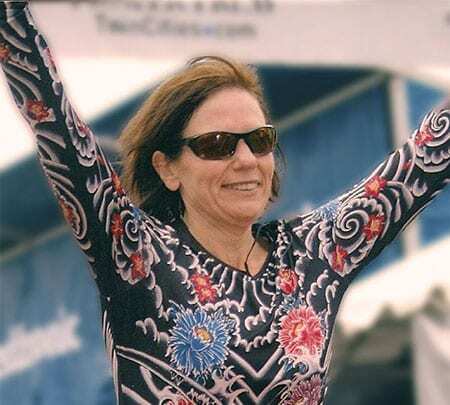 And, of course, not just any triathlon – the 70.3 half ironman in Augusta (1.2 mile swim, 56 mile bike and 13.1 mile run.) Without knowing how to swim and with very little experience on the bike. But the challenge spurred Mike to recover and then start training. 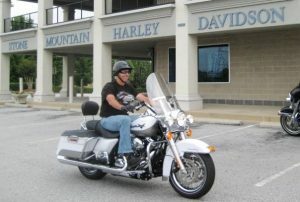 And the charity ride introduced him to people who would be instrumental in equipping him and training for his triathlon. He struggled to learn to swim. He asked his friends how they managed to swim 100 yards, much less the 1800 meters involved in a 70.3. 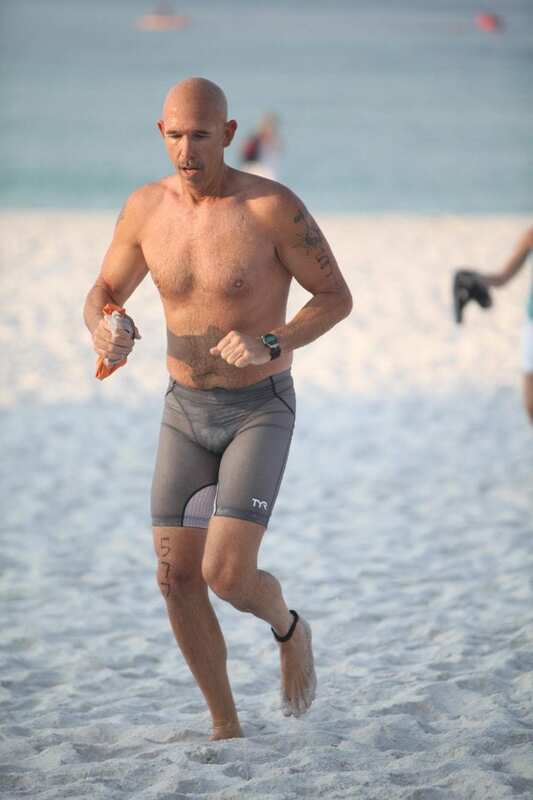 On his road to Augusta, he participated in a sprint triathlon in Florida. And had a panic attack in the water, crawling out of the water in last place. But none of these challenges stopped him, and in September, 2011, Mike did it. Completed his first half ironman. 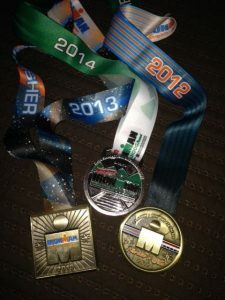 And he had the bug to do more, and signed up for his first Ironman in Florida in 2012. He dedicated himself to doing it right. He never missed a workout. He stayed with his training plan. And he finished an ironman just two years after crushing his pelvis on a 30 mile charity bike ride. Since then, Mike has completed two more ironman races and is training for a fourth this year. His times have improved, he has grown stronger and made friends to last a lifetime. Mike says the best thing about his journey is the people he has met and the friends he has made. 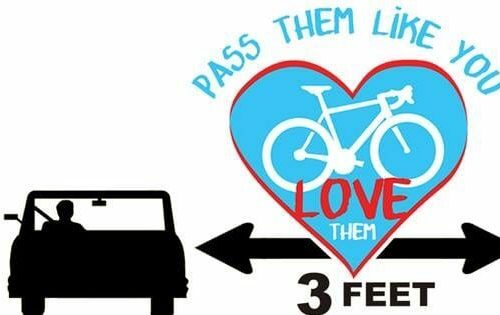 From road trips to races to the mutual support they give one another, friends make training and racing fun. His training buddy Miles Bay laughs at the time they created their own 10k race to test their training targets. They wore old race numbers and ran a race against one another, with the other folks on their path scratching their heads wondering what was happening! The prizes – a pine cone and a rock! 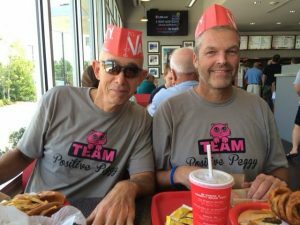 And when Mike’s friend Peggy wanted to run a 50 mile trail race to celebrate turning 50 and conquering breast cancer, Mike and Miles were there to train and run the race with her. His friends are amazed at his hard work and dedication. 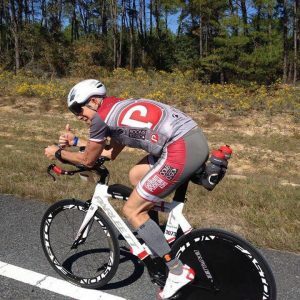 “He has never shied away from a challenge – from his first marathon, to his first triathlon, to his first Ironman and to his first ultra marathon.” In addition to being an incredible athlete, Mike’s friends all agree – he is one of the nicest most humble people they know. “Mike is a gentleman and a true friend – he is the real deal,” says Cherie Eason. And perhaps most important – believe in yourself! 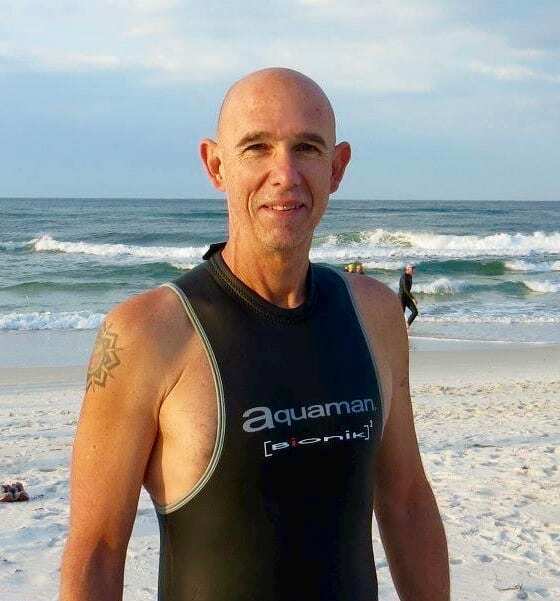 This year, Mike is participating in Ironman Chattanooga with a new focus – raising funds to give back to the local community. 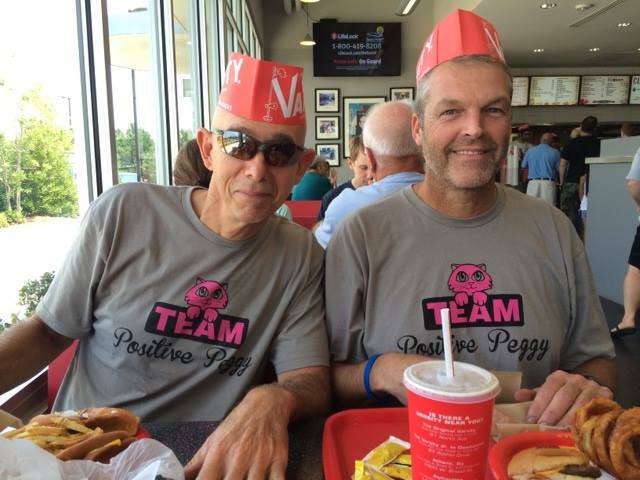 You can learn more about the Ironman Foundation and support Mike’s fundraising objectives. You can learn more about Ironman Chattanooga and follow Mike’s progress on September 27, 2015 by clicking on 2015 Ironman Chattanooga. 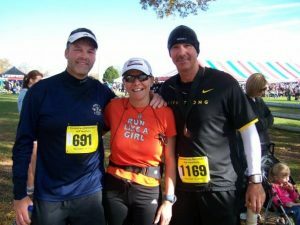 I read your Friday fitspiration on the run ladylike blog. Jessica featured my daughter Lauren and I on an earlier Friday this spring. I’m 57 running, taking a barre3 class , Zumba and I’m down 52 pounds with 9 more to go! I never thought I would find the joy in being fit and at 57 years! I’m no longer on the sideline I’m in the mix. Thanks for the inspiration. I’m in Georgia too in Marietta. If you ever run at the river or ride perhaps our paths will cross. 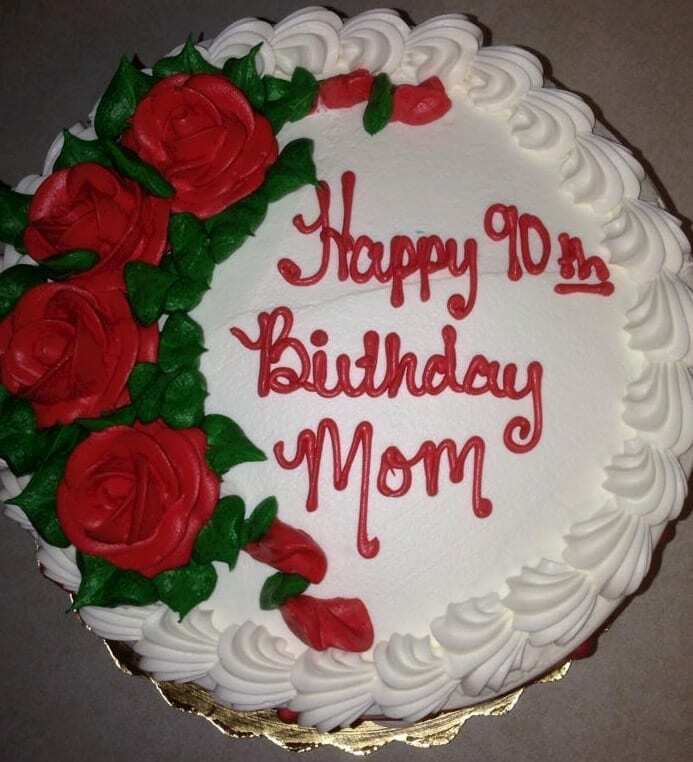 That is awesome, Mary! What an accomplishment! I got your e-mail and will contact you directly! I agree Mike is an amazing person. Unfortunately I had a business partnership with him and he chose to run up over $10,000 worth of personal credit card purchases. The credit cards were issued as myself being the credited. Mike was given a card for small business purchases. I think after 10 years he is finally paying them off but the credit card company has called me quite a few times over the years asking for late payments.This ruined our business and personal relationship.